With the onset of spring, the attention of many Canadians turn to the perennial quest for the Stanley Cup, the storied challenge trophy, emblematic of hockey supremacy. Few realize that in Alberta one of Canada’s oldest sporting challenge trophies was established in 1909 by then Premier, Alexander C. Rutherford and is competed for until the present day. The history of the Rutherford Cup is as old as that of football’s Grey Cup and senior hockey’s Allen Cup all of which were established 106 years ago. Alexander Cameron Rutherford, Alberta’s first Premier [1905-1910], distinguished himself not only as a legislator but also as an active participant in many aspects of Alberta’s developing society. Sporting activities featured prominently among Premier Rutherford’s many interests. He held executive positions with baseball, curling and football (what we now call soccer) clubs in Strathcona and established competitive trophies for the Strathcona Curling Club and the Strathcona Football Club. 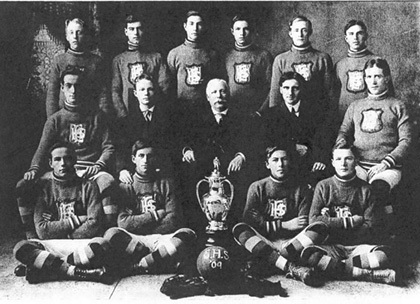 In 1909 Rutherford also established a challenge trophy to be vied for by senior high school soccer teams in central Alberta. The first competition for the cup culminated on the afternoon of Saturday October 16, 1909 at Edmonton’s Diamond Park in a match between Edmonton High School and Red Deer High School. The Edmonton press lamented the result of the match with partisan headlines: “Red Deer Grabs Rutherford Cup E.H.S. Pigskin Chasers Are Defeated by Students From the Half Way City.” The City of Red Deer celebrated that their boys had successfully journeyed to Edmonton and “annexed the handsome Rutherford cup” on the strength of Krause’s “doing the needful.” The Red Deer Advocate noted that the boys were “deserving of high praise for their clever play” and paid tribute to Edmonton’s hospitality. Following the match the competitors were royally received at a banquet hosted by Col. Robert Belcher, whose son captained the losing side. Figure 2 Archbishop O’Leary High School, Winners of the Rutherford Cup, 1994. Source: Alberta Culture and Tourism. Since its inception in 1909 the Rutherford Cup has been competed for almost annually, making it perhaps Alberta’s oldest athletic competition. 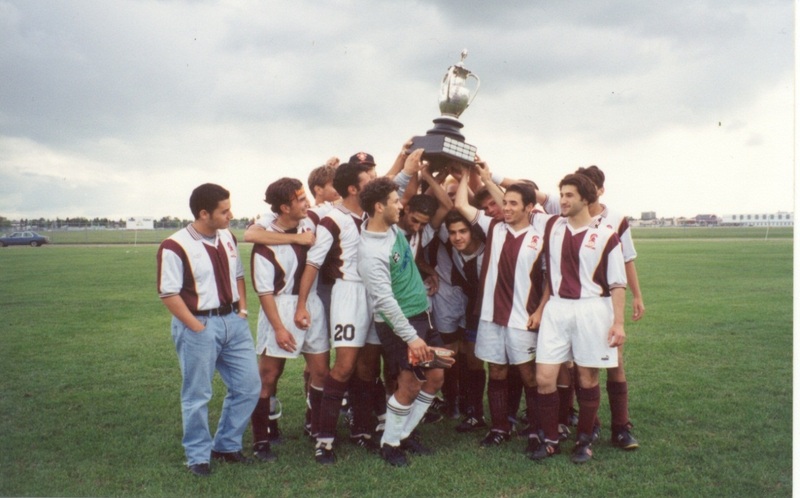 Until 1988 senior soccer teams from the Edmonton Public and Separate (Catholic) Schools Boards challenged each other for the cup. When these two boards discontinued their joint athletics board, the competition lapsed and since then only senior schools of the Separate system have competed for the cup within the Metro Edmonton High School Athletic Association which currently includes 51 member high schools from the Edmonton and Metro Edmonton area. To follow the annual progress of play for the Rutherford Cup check the Metro Edmonton High School Athletic Association website at: http://metroathletics.ca/index.php. The original version of this article appeared as “1909 Rutherford Cup – The Start of an Alberta Sporting Tradition” in Alberta Past, Vol. 11, No. 2, Spring, 1995. Written By: Peter Melnycky, Historian, Historic Places Stewardship Section, Alberta Culture and Tourism. The history of Old St. Stephen’s College spans over a century and while the building itself is unique, it is the people have who have lived and worked here that bring out its uniqueness. In its time as an educational facility, the college produced a large number of graduates who went on to become ministers, employed renowned educators and housed thousands of students. 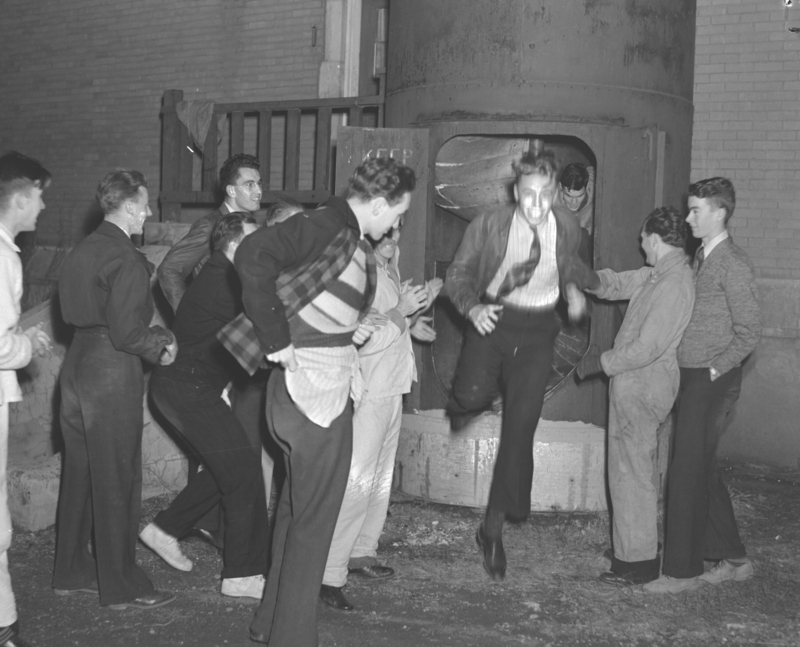 Residents participated in the traditions and customs of campus life and the building became eminent for the pranks that were carried out there. This post will look at the people of Old St. Stephen’s when it functioned as a theological college and some of the stories that illustrate the student’s social lives. (Courtesy of the University of Alberta Archives, UAA 72-58-0294). Students were the majority of the building’s inhabitants: up to 150 youths were housed in the college at once and they didn’t spend all their free time studying. After the First World War, the college installed steel spiraled slides, to be used as fire escapes, at the end of each wing. During this time, the college had become a convalescent home for injured soldiers and the fires escapes were meant to evacuate patients as quickly as possible in an emergency. The fire escapes were never used for their intended purpose, but the students made use of them for their own enjoyment. Freshmen were initiated by their fellow classmates, who would dump the unlucky first years down the slides and then chase them with buckets of ice water. This custom continued into the 1970s, up until the fire escapes were removed during the renovations and replaced with ladders. In addition to the pranks and hazing that took place, there were water fights with neighboring residences that highlight the enjoyment of student life on campus. The students had a great deal of playful fun here. Another tale is from when the Rutherford Library was being constructed in 1948. On the evening of the cornerstone-laying ceremony, the cornerstone mysteriously disappeared, only to turn up behind the college’s west wing fire escape. The stone weighed 700 pounds, and everyone presumed that engineering students were the culprits. However, in 2008, the secret was revealed in New Trail, the University of Alberta’s Alumni magazine. The escapade was actually the work of a group of agriculture students living at St. Stephen’s College. Turns out, the students borrowed a milk cart from the St. Stephen’s kitchen and attempted to haul the stone as far as 109 Street. Being heavier than anticipated, they only made it as far as St. Stephen’s College. To the student’s dismay, the stone was discovered just hours before the cornerstone-laying and the ceremony proceeded as planned. 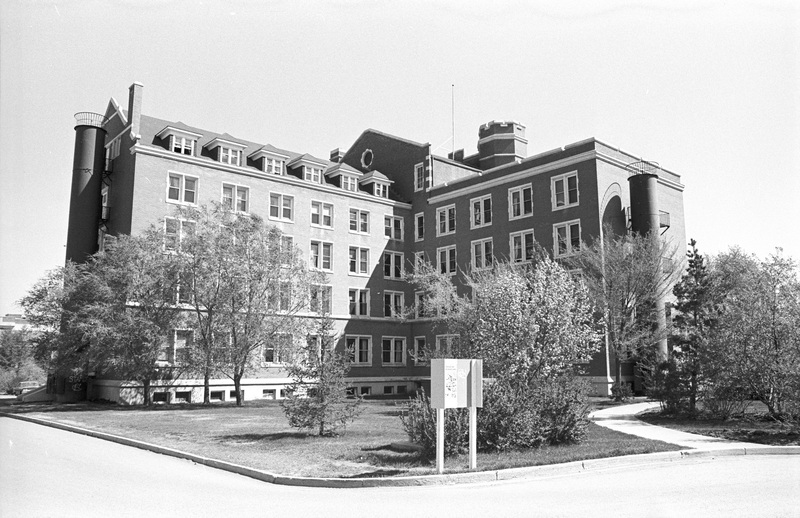 Old St. Stephen’s College, 1971 (Historic Resources Management Branch, 71-R0001-29). The tubed fire escapes on the wings of the building were installed in 1920. 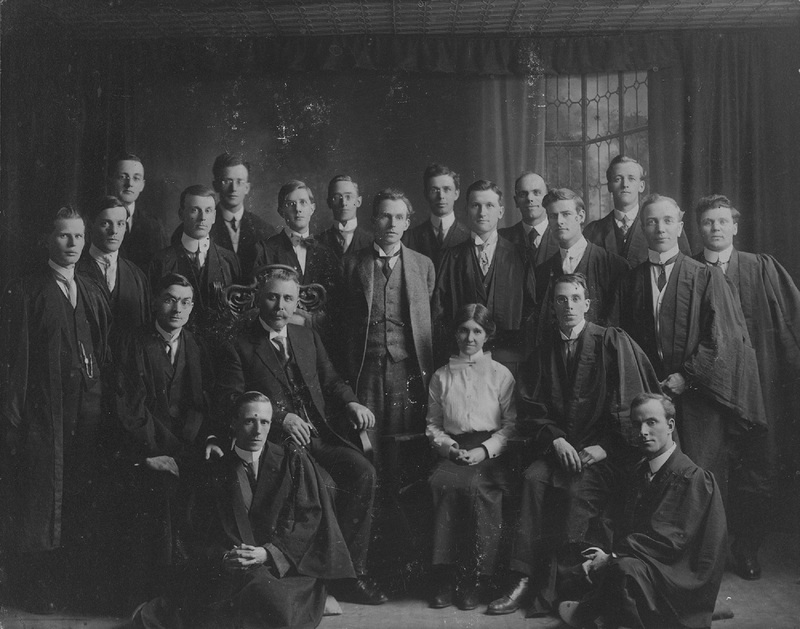 Formal group portrait of the members of the Alberta College South Glee Club, 1912-1913 (Provincial Archives of Alberta, A16351). When the building was home for the students of St. Stephen’s College, it was a place where friendships were formed, bonds between students and instructors were strengthened and fun was had. The building has seen thousands of staff and students pass through its hallways and numerous tales have been accumulated. These stories help to illustrate the liveliness of the former college and show us that it is the people who make history come alive. What can you tell us about your time spent at Old St. Stephen’s College? Let us know your stories! Written by: Erin Hoar, Historic Resources Management Branch Officer. Alberta Register of Historic Places. “Old St. Stephen’s College.” (Accessed September 10, 2014). Designation File # 132, in the custody of the Historic Resources Management Branch. Schoeck, Ellen. I Was There: A Century of Alumni Stories about the University of Alberta, 1906-2006. Edmonton, Canada: The University of Alberta Press, 2006. Simonson, Gayle. Ever-Widening Circles: A History of St. Stephen’s College. Edmonton, Canada: St. Stephen’s College, 2008. “The Caper.” New Trail: The University of Alberta Alumni Association, 2008, 26-28 (Accessed September 13, 2015). University of Alberta. “University of Alberta: St. Stephen’s College.” (Accessed September 10, 2014). A note on naming: the institution was initially known as Alberta College South. ACS and Robertson College were amalgamated in 1925 and renamed the United Theological College. The name St. Stephen’s College was chosen in 1927. It became known as Old St. Stephen’s College in 1952 when a new St. Stephen’s was built directly south of the existing college. 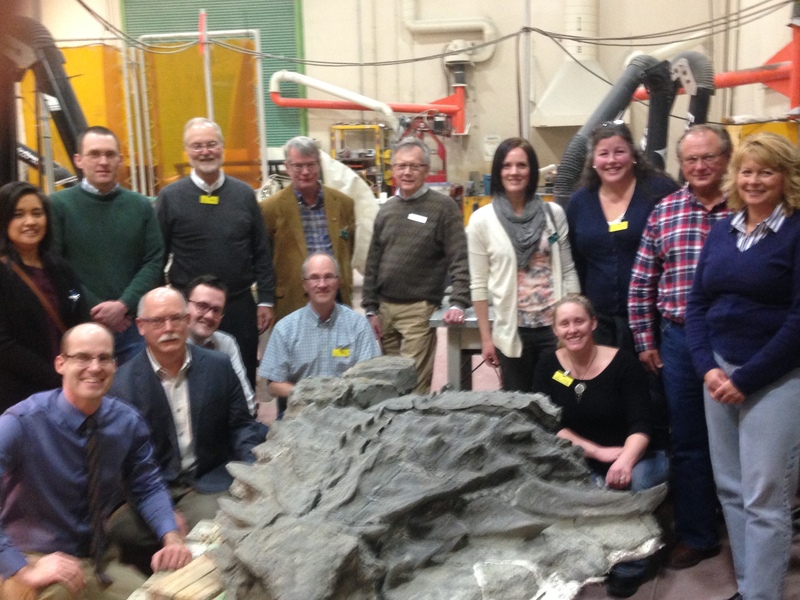 Board members of the Alberta Historical Resources Foundation (AHRF) recently held their first meeting for 2015 in Drumheller. The two-day meeting kicked off late Thursday afternoon with a walking tour of downtown. Though held under frigid temperatures, the tour was led with a warm welcome from the Town’s staff. Friday morning was dedicated to a strategic planning session at the Royal Tyrrell Museum. Thanks to Fred Tyrrell, a Community Development Officer from Alberta Culture and Tourism, who served as our facilitator. Topics explored included: promoting greater appreciation for Alberta’s heritage among new Albertans; ensuring that the not-for-profit and voluntary sectors so essential to our province’s heritage facilities and sites are sustainable and strong; and developing innovative and compelling ways to share Alberta’s story. As part of the foundation’s efforts to reach out to the local heritage stakeholders, Julia Fielding, Executive Director of the Atlas Coal Mine Historical Society came and chatted with the board about the challenges and opportunities faced by the Atlas Coal Mine, a Provincial and National Historic Site in East Coulee. The afternoon continued with a conference call with our colleagues from the Alberta Foundation for the Arts who provided us a glimpse of how they operate. Then it was time to get up for a special treat – a behind the scenes tour led by Don Brinkman, Director of Preservation and Research of the Royal Tyrrell Museum. Don showed us the intricate and exciting process of preparing fossils after being collected from the field. Sitting from left: Matthew Wangler, Kurt Paterson, Josh Traptow, Joe Friedel, Leah Millar. Standing from left: Carina Naranjilla, Michael Dougherty, Fred Bradley, Larry Pearson, Lorne Simpson, Aimee Benoit, Laurel Halladay, Bob Gaetz, Geraldine Bidulock. Saturday was another busy day, starting with presentations from the five Provincial Heritage Organizations (Alberta Genealogical Society, Alberta Museums Association, Archives Society of Alberta, Archaeological Society of Alberta and Historical Society of Alberta) that AHRF supports. This gathering provided an excellent opportunity for networking and future collaboration. The rest of the afternoon was the main board meeting where a number of general business items and applications from the Municipal Heritage Partnership Program and Alberta Main Street Program were discussed. Those two productive days emphasized the need for strategic thinking, collaboration, engagement, and sustainability in order to preserve Alberta’s heritage. Written by: Carina Naranjilla, Grant Program Coordinator, Alberta Historical Resources Foundation.